COMMENTS: I made simple cocoa butter soap. 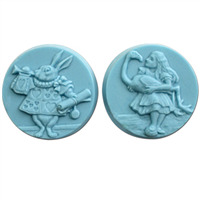 I usually prefer silicone molds, but the bunny design works perfectly for my Barebunns brand. 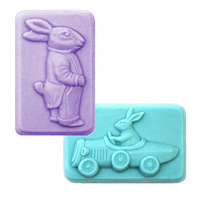 "I have had a hard time getting my cp soaps put of the plastic molds without cracking the mold. I use spray oil. Is there something better. Getting frustrated..."
Staff Answer Try placing into freezer for 30 minutes, and then immerse bottom of the mold in hot water for a few moments. 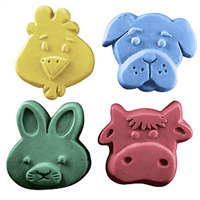 It could be that your soap is too soft. You could try waiting for it to cure longer. Also, adding sodium lactate to your recipe will make it harder, and ease the unmolding process.